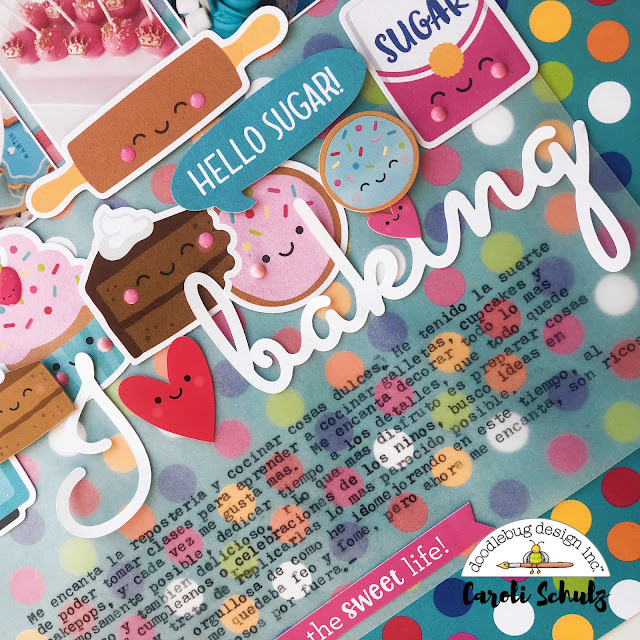 The title of this layout says it all: I love baking! I have loved it since I was a kid and through the years I've had the chance of taking a few classes in order to improve my skills. 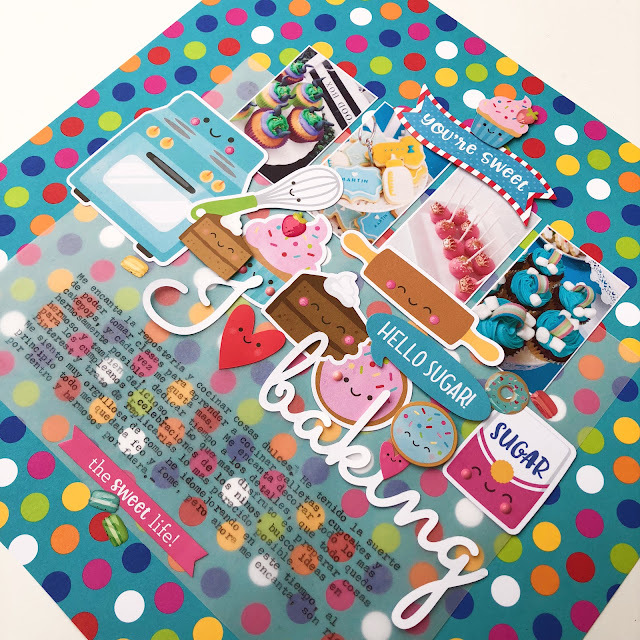 I enjoy making pretty and yummy cupcakes, cookies and cake pops for my family and friends, and this is what this layout documents. 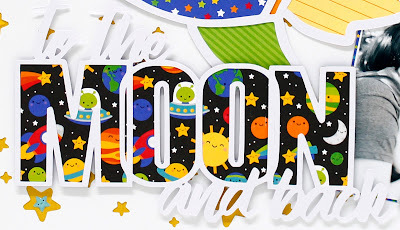 When I saw this rainbow dotted paper of So Much Pun collection I knew I wanted to use it as the background for my layout. I loved the bright colors and the turquoise background, but since the pattern is a bit intense, I decided to use a piece of vellum in order to soften the colors and make it work as a background. Of course, I used a bunch of diecuts from the Odds & Ends package, all the baking related ones. I added an extra touch by using some sprinkles as pin cheeks, this makes them even more adorable, if possible. For the title I used the free font "Sacramento" and cut it on white cards stock and dragged out my typewriter to add the journaling directly onto the vellum. As always, volume is a very important element, so foam dots to create different levels on my layout. 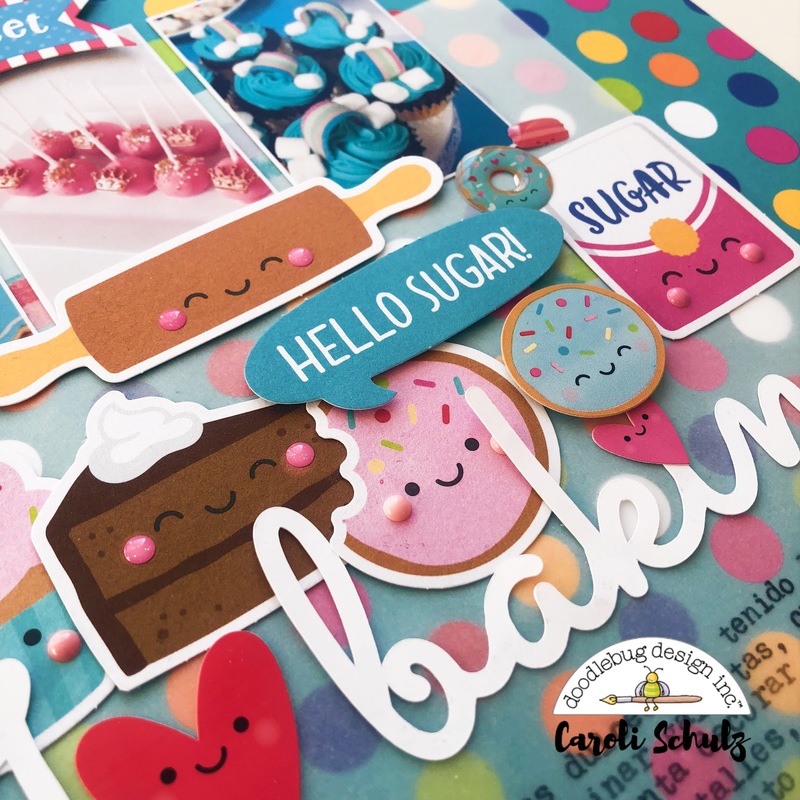 Shapes sprinkles are a great addition to any diecut, don't you think? 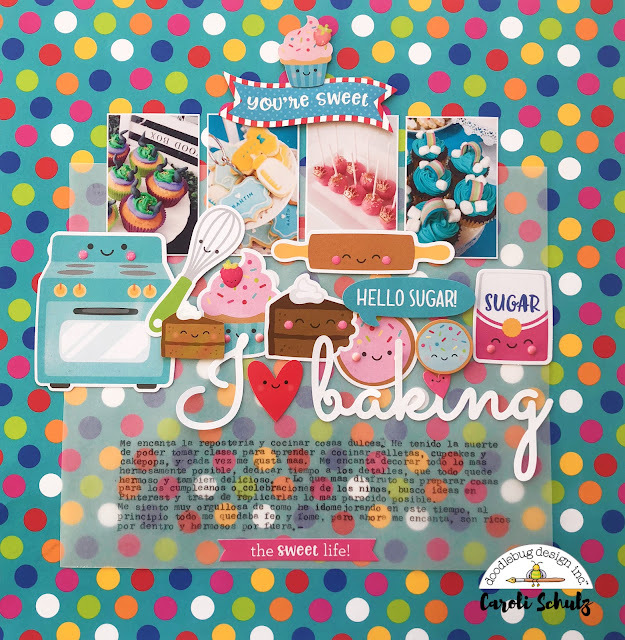 I love layouts with many photos, so I used 4 tiny photos of some of my latest baking creations, I've made them all for birthday parties and for my baby shower. I hope you liked this idea and give it a try. As I said before, I am trying to get out of my comfort zone and use more colorful/busy patterned backgrounds, I think I've succeed with this layout. I know you don't want to think about it yet, but it is only a matter of time before cold and flu season is upon us. In fact, parts of the world, it already is! So it is never too early or too late to be prepared. 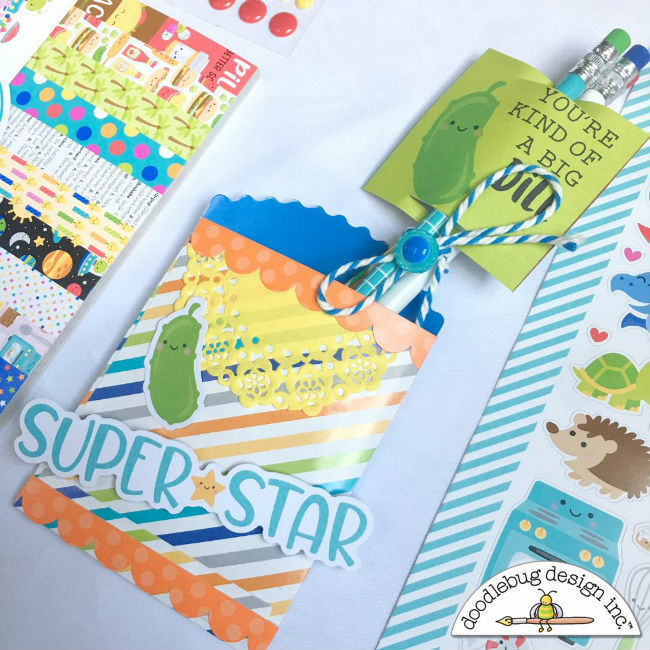 And yes, you guessed it - Doodlebug is here to help with the new and adorable So Much Pun collection. If it doesn't cure you with smiles, laughter and cuteness, it can certainly help make managing a running nose a little more bearable! This little pocket tissue holder is a breeze to create. It simply wraps around one of the small, pocket-sized tissue packages that easily slides in and out. 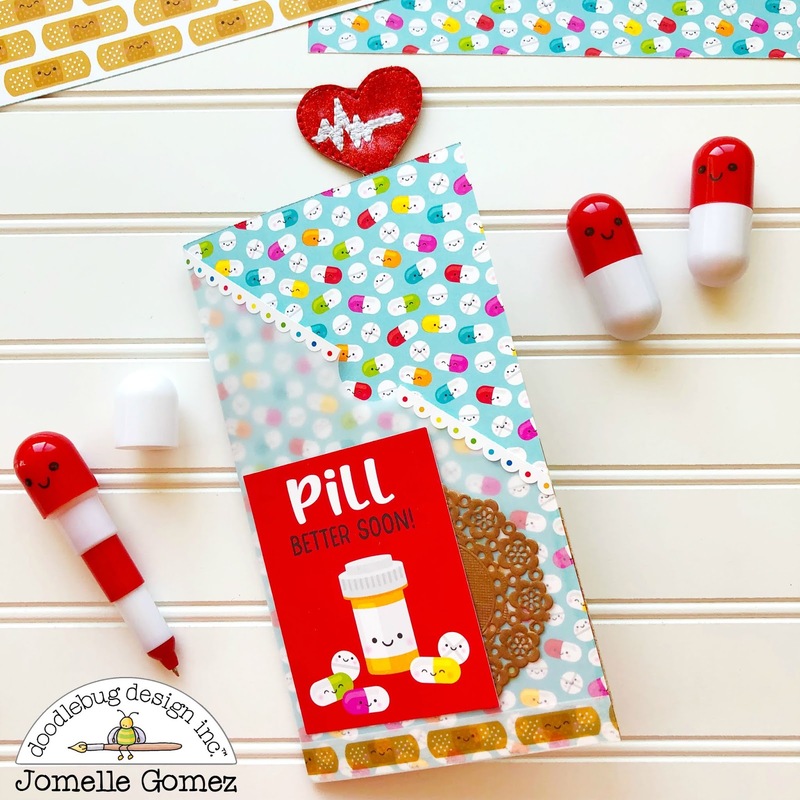 The Pill Better Doodlepop was the inspiration for this whole project. I mean, how cute is this Doodlepop (so cute that I almost didn't want to use him! I tend to hoard...I mean "collect" my Doodlepops)?!! The dimension and highlighting on him is spot on, but those cute eyes are just the best! 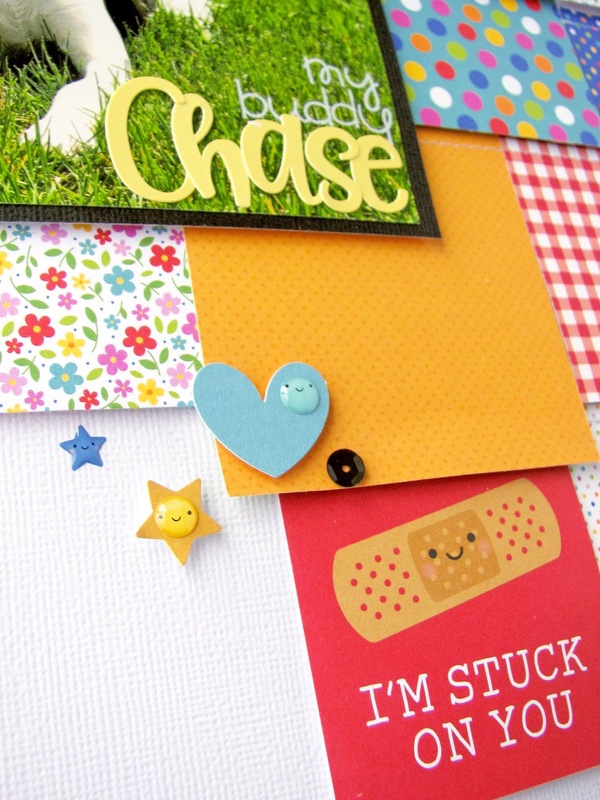 I also teamed up the Doodlepop with a couple of cute sentiments from the Chit Chat pack. 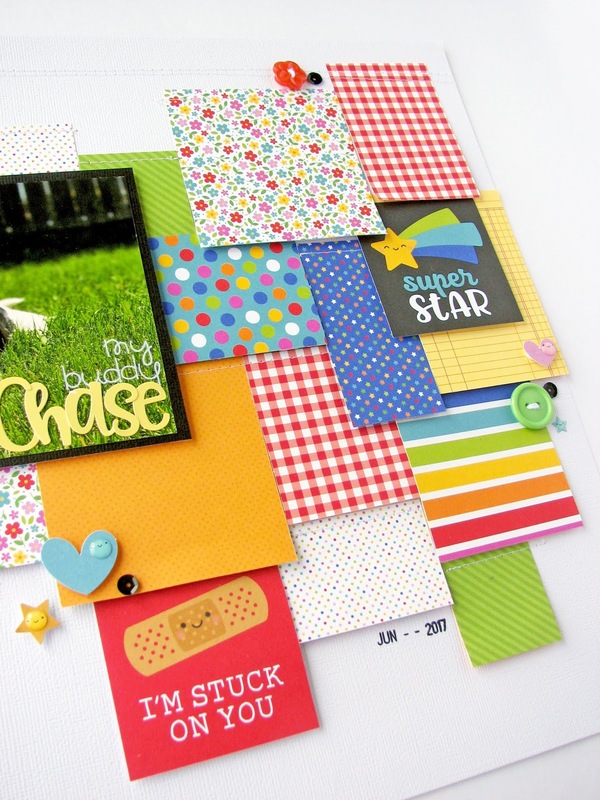 The Chit Chat packs are really a card-makers dream! 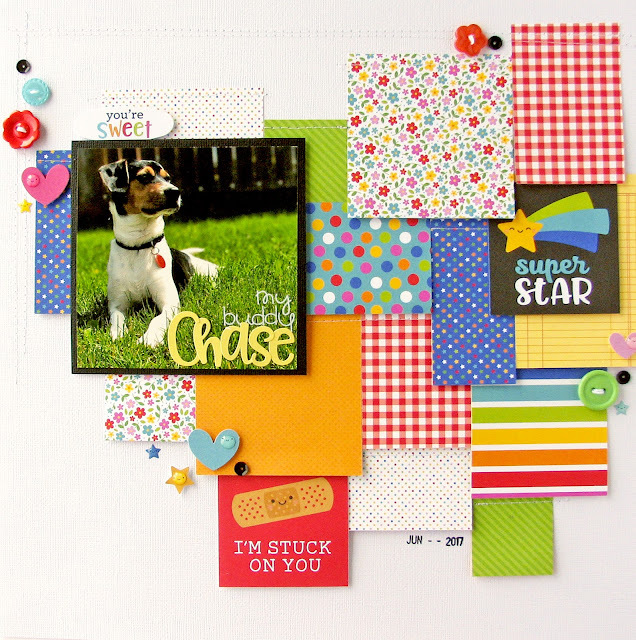 This particular collection covers any and every occasion you can imagine, and even a few cute die cuts like hearts that help fill up those spaces that need a little extra "something". As always, I added one of the darling mini paper clips and a mini doily; for texture. 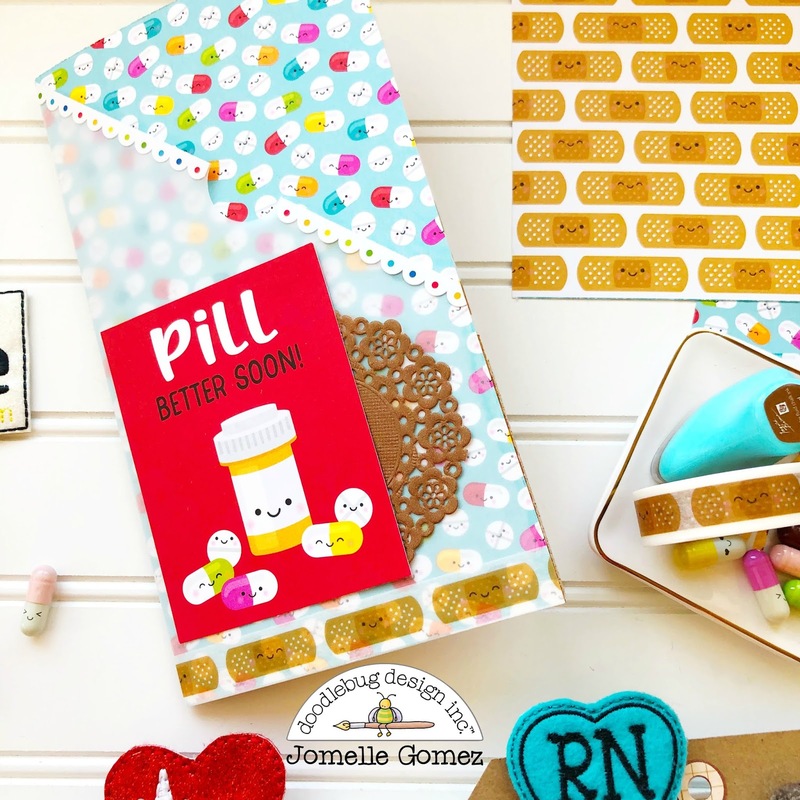 And while there is only a little bit peeking out from behind the Doodlepop and sentiments, the Pill Better patterned paper is as cute as it gets! 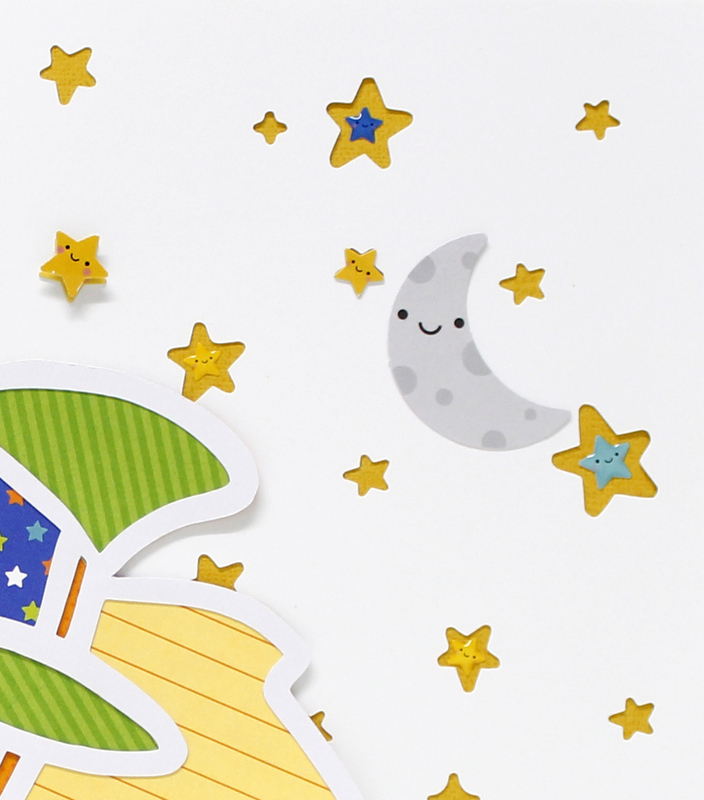 So grab your Petite Prints and So Much Pun paper and get crafting! Your nose, or someone else's, will thank you for it! p.s. 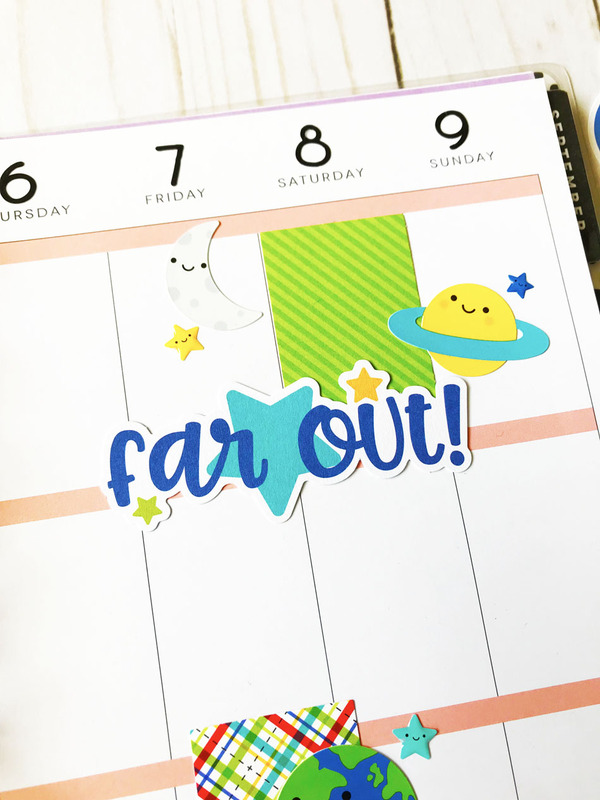 - If you are a Cricut user and are interested in the cut file I created for the base, click here. For all the cute embellishments, go shopping! Here in the US, it is time to be heading back to school. As a teacher, this time of the year is definitely bittersweet. It's the end of the summer, but the beginning of another fresh year. So, I thought I would create a project that would be useful for parents and teachers alike. I'm always one to give little gifts at the start of the year. I decided to create some little pencil favors that I could give to my students using the fun So Much Pun collection. Here is how they turned out. Let me show you how I created them. 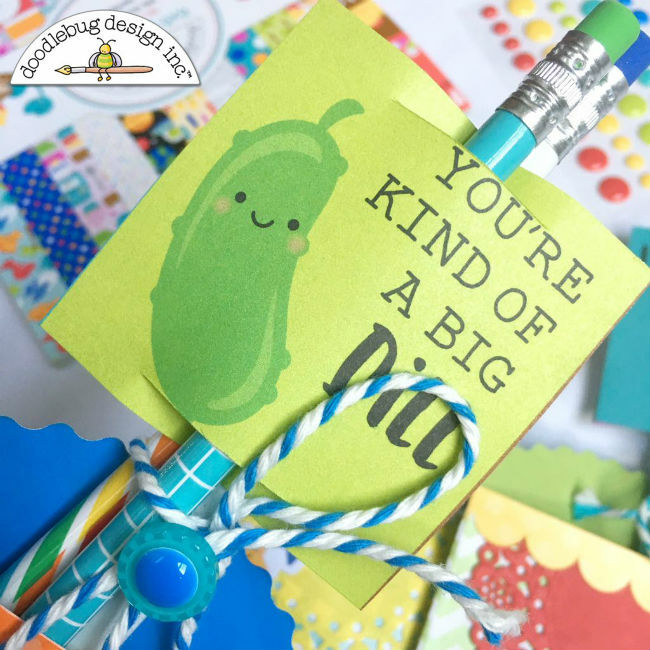 I thought the little pun cards on the 12 by 12 patterned paper would be perfect pencil toppers. I used an x-acto knife and cut slits so that I could slide a pencil through them. I chose the cards that I thought reflected encouragement for the kids. Once I had it on the pencil, I used two other pencils and tied them together with the chunky twine. I added a button topped with a sprinkle dot to the bow. Next, I grabbed some of the little decorative bags. I knew they would be the perfect way to hold the pencils. On each, I added a doily and the matching stickers, die cuts and chit chats. I also added some fancy frills to the top and bottom of the bags. Seriously, I love these stickers. They can be used with everything!!! I followed the same pattern for each little favor, which made pulling them together easy to do. It took no time to create the project and I'm sure they kids will be so excited to receive them. Not a teacher? No problem. These are great to give your own kids or grandkids. Or you could tuck a $5.00 gift card in the pocket (Dunkin Donuts, Starbucks, etc.) and make your child's teacher feel really special on the first day of school. I love how versatile this collection is. 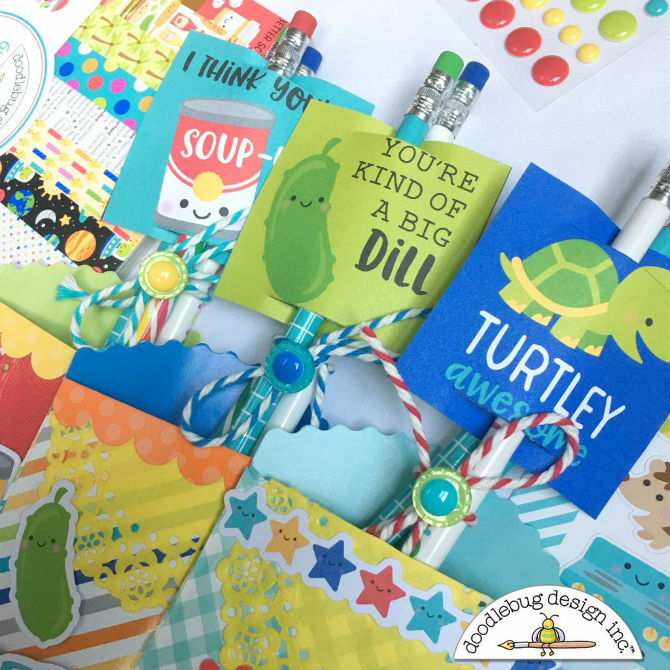 From my Taco Themed planner spread (my last post) to kid's favors, there's a million things you can do with it. Thanks for stopping by and have a wonderful day! I am totally "stuck" on the new So Much Pun collection! 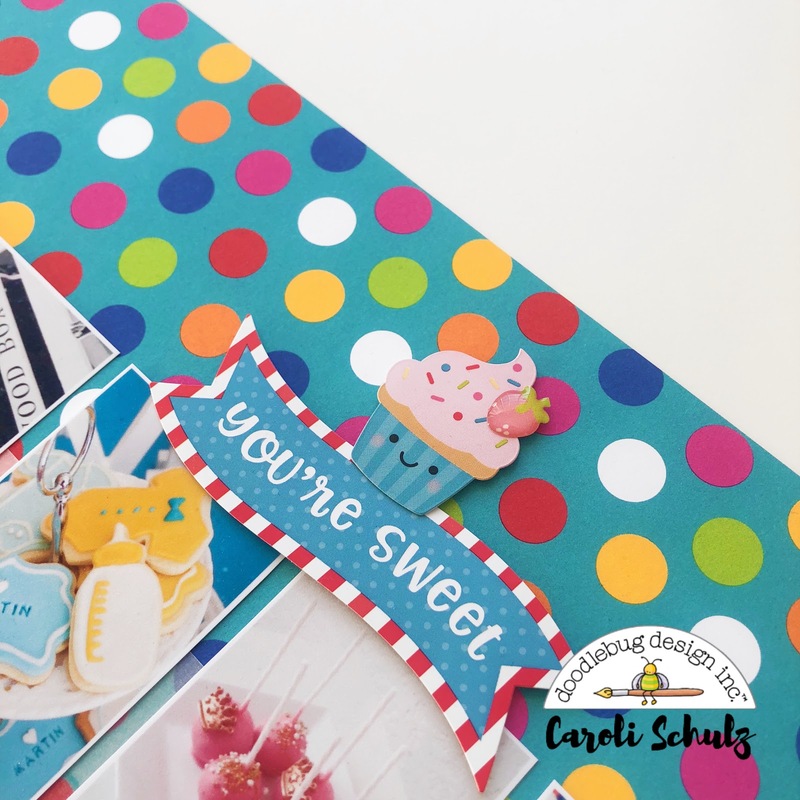 I absolutely love the whimsical feel to this new range and I love how the papers are so different yet you can mix and match to still achieve a cohesive and fun look. And, I had a hard time choosing which papers to leave out so in the end I decided on a layered design which allowed me to use all my favourites and more. I grabbed the 6x6 paper pad and cut some simple squares and rectangle and loved the rainbow of colors and patterns to choose from. The great mix of colors made it quite simple to layer the papers together - I added some foam adhesive behind the bottom of the layers to pop them up a bit. 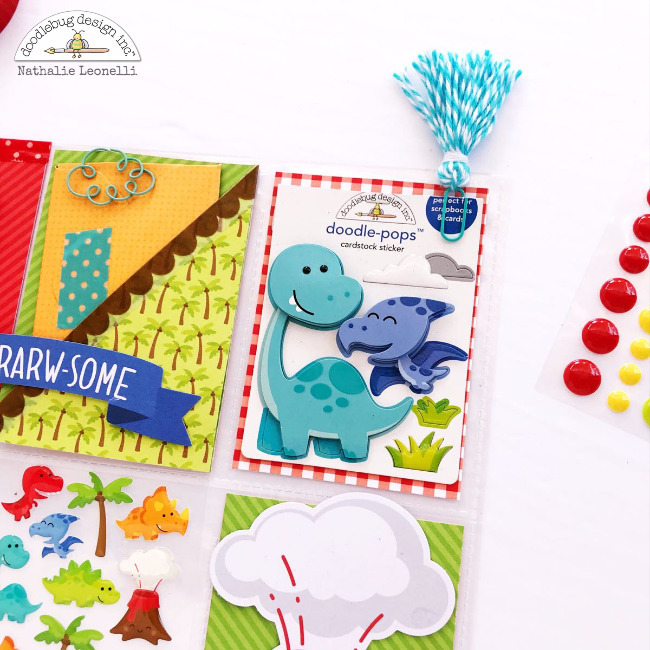 Because this collection is true Doodlebug style, it's easy to add in some Doodlebug Essentials like the Boutique Buttons I added in various colors. 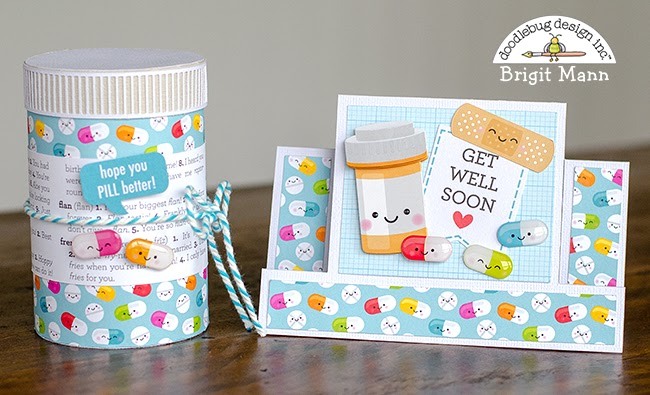 Here's a little pick-me-up gift set for someone who isn't feeling very well. The So Much Pun collection has the perfect papers and embellishments for just about any project. With all the cheerful characters, anything you create with it will definitely put a smile on somebody's face. 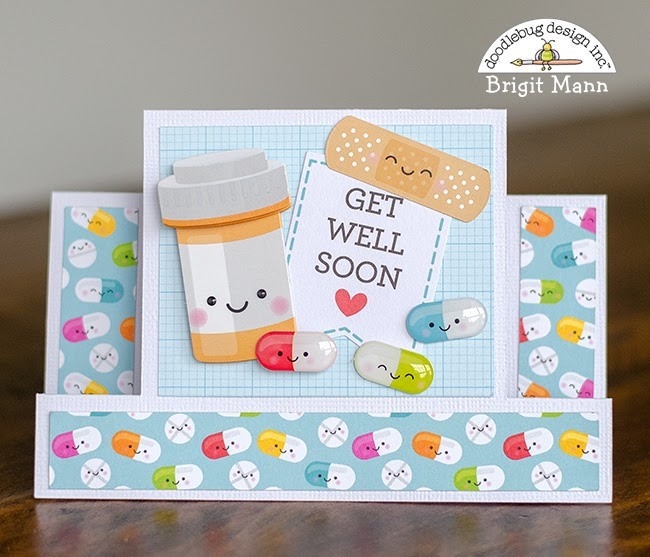 The pill better paper is one of my favorites in the collection, the pretty blue background with all the colorful smiling pills is the perfect paper for any get well soon project. The card is a cut file from Lori Whitlock's shop center step card snowman. I deleted the snowman piece and created a center layer which was cut out using the new swimming pool floral-graph petite prints from the floral-graph rainbow petite prints 6x6 paper pad. 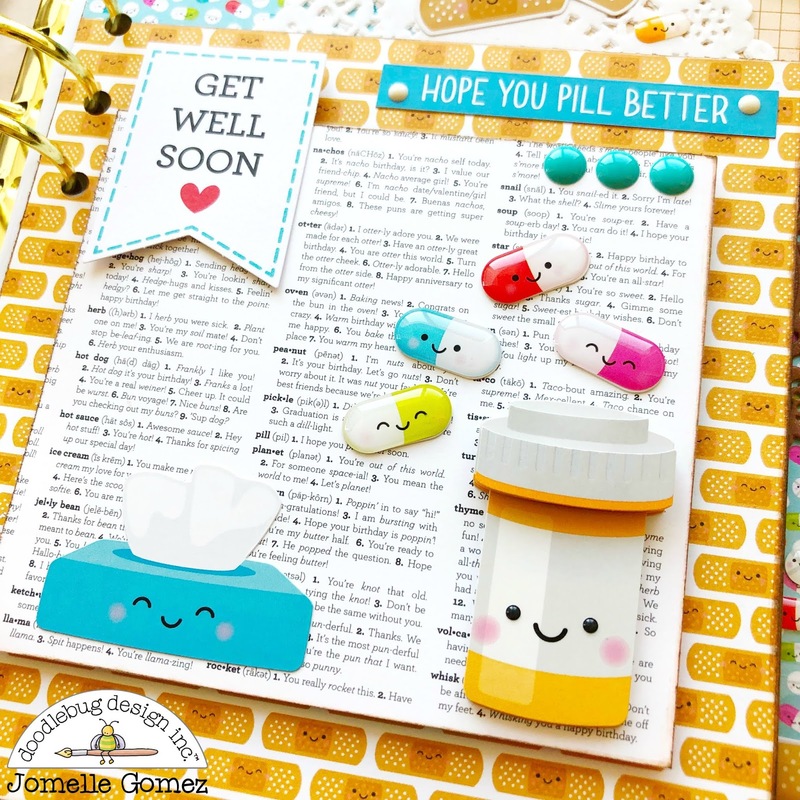 The get well soon banner is from the so much pun chit chat pack, band-aid from the so much pun icons sticker sheet and the pills and bottle from the pill better doodle-pops. For the pill bottle, I used the tall circle box from Lori's shop, made it smaller and duplicated the top side piece and created the slots to make it look like a pill bottle top. 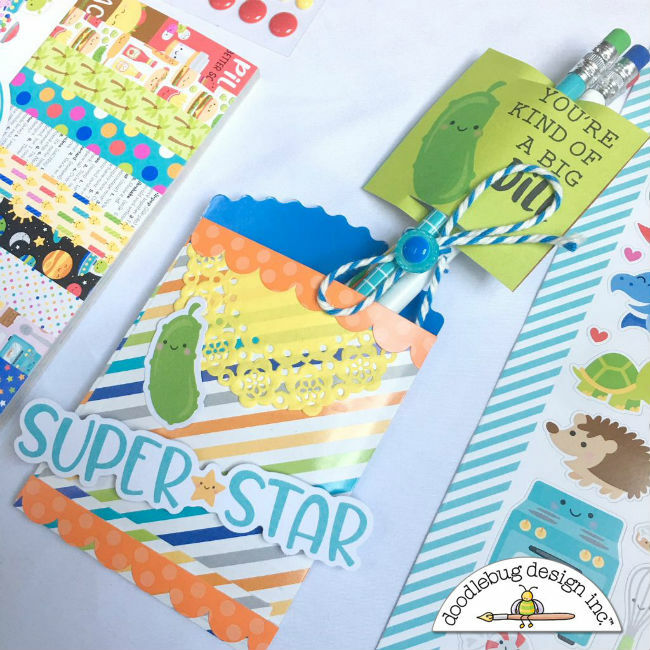 I used a piece of the so much pun paper as the label and added the speech bubble from the so much pun chit chat pack, two pills and some swimming pool chunky twine. Looking for some "out of this world" embellishments and papers for your planners? Look no futher than the So Much Pun collection! 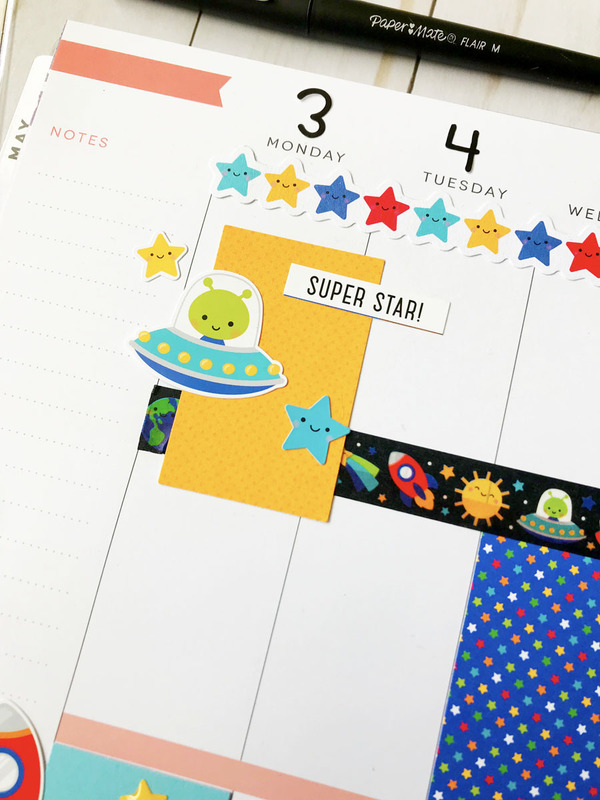 I love all the cute space themed elements in the collection so much I thought they deserved their very own week in my Happy Planner! 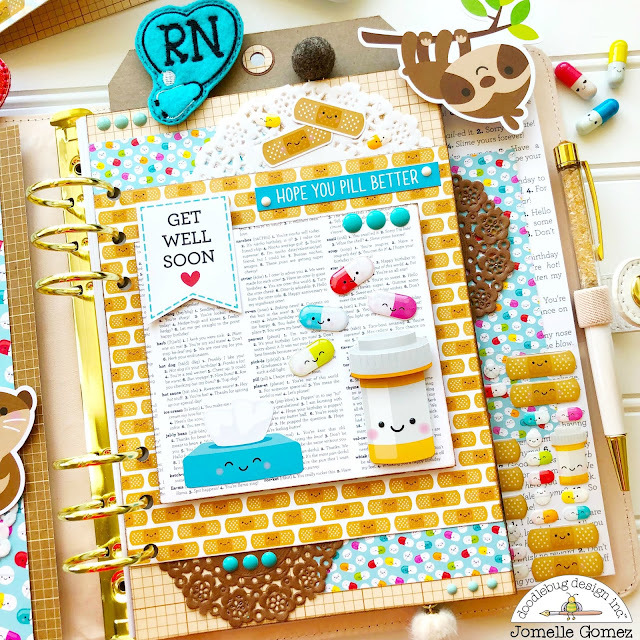 Here are a few close ups of the pages- There are so many fun little bits you can use in this size of planner. I used shape sprinkles, Chit Chat, Odds and Ends, Icon Stickers, Mini Stickers, the This and That sticker sheet and my papers are from the 6x6 paper pad that I trimmed down to fit the boxes. I also used my favorite Washi tape from the collection. The black tape with the cute icons really pop off my white page. I also used some Teensy Type stickers in Beetle Black for the numbers on top. 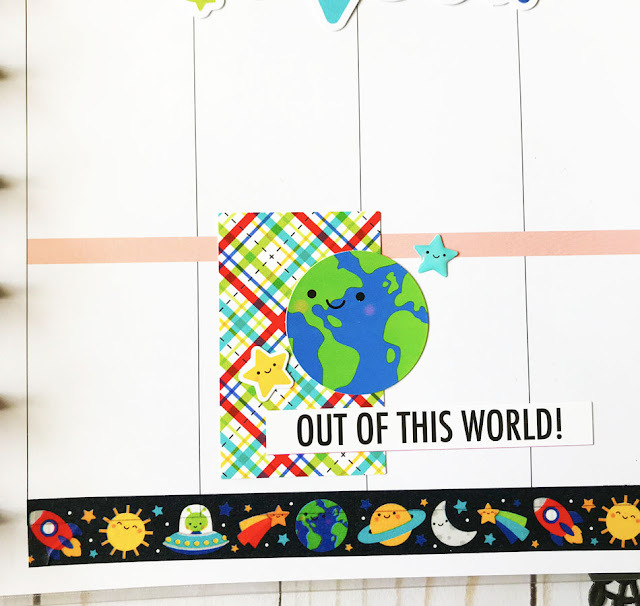 Thank you so much for stopping by the blog today and taking a peek at my planner spread! This collection has so many little sub themes in it, I could choose a new theme for weeks and not have to repeat anything. I hope I have inspired you today with my project to add a litte So Much Pun to your own planner spreads. Happy Crafting! 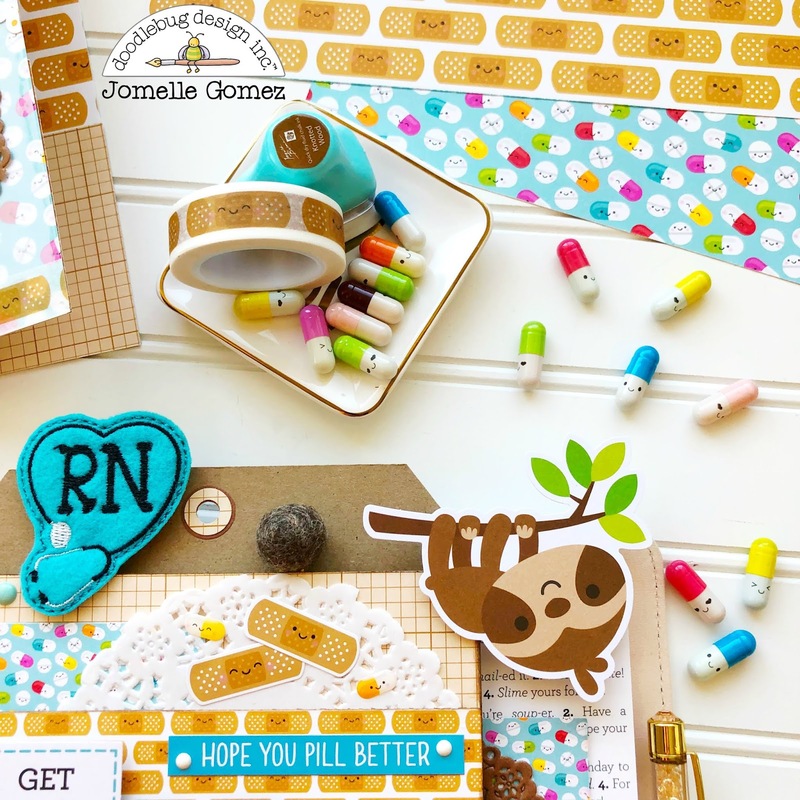 When the "So much Pun" collection was released, the first thing that caught my eyes were the band aids, all the cute pills and the pill bottle. 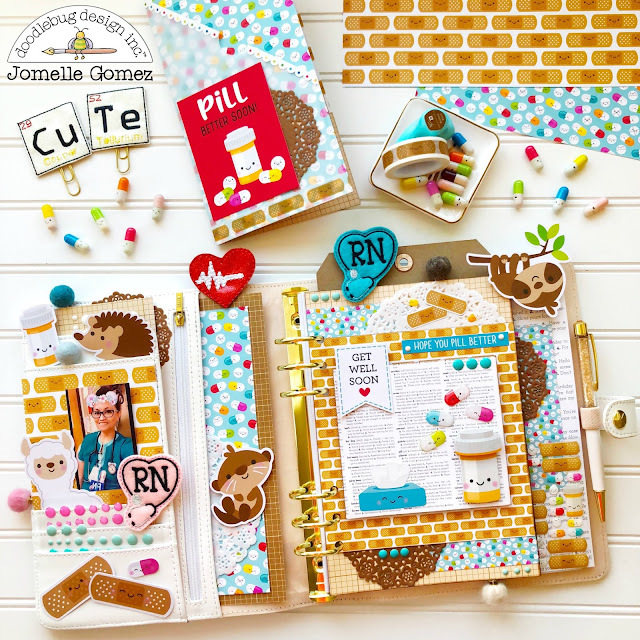 I am an Oncology Registered Nurse and I was really excited that Doodlebug released some elements that relates to the medical field. To create my dashboard, I used a beige cardstock for the base and I layered 3 different cardstock from the 6x6 paper pad. I inked all the edges with a dark brown ink. I just had to add the hanging sloth since he is so adorable. Close Up of my dashboard. 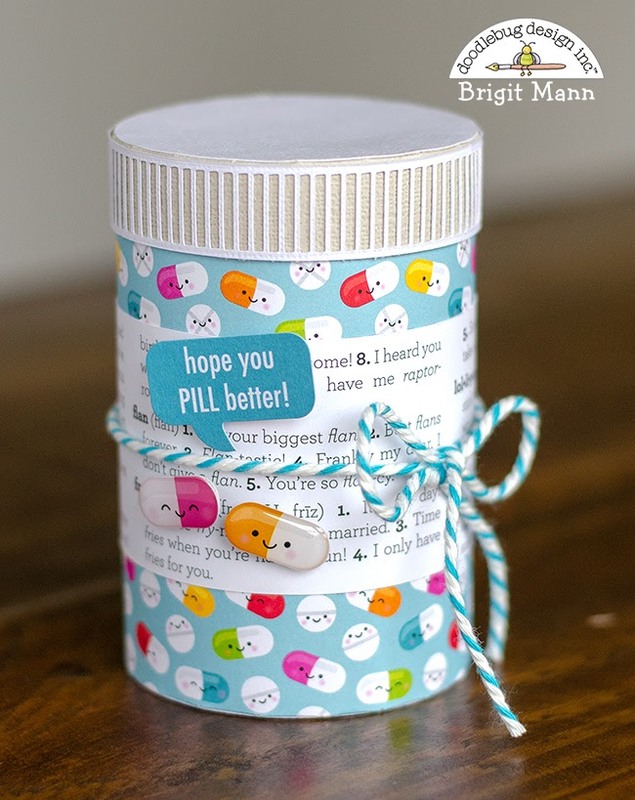 I knew right away that I wanted my project to be all about band aids and the kawaii pills. "Flu Season" is just around the corner and I hope you all stay healthy. I will be busy taking care of patients who are very unfortunate to get the flu. I don't normally carry my A5 planner around with me. I usually leave it at home. Since I tend to bring my TN with me, I wanted to make a cover for my insert. 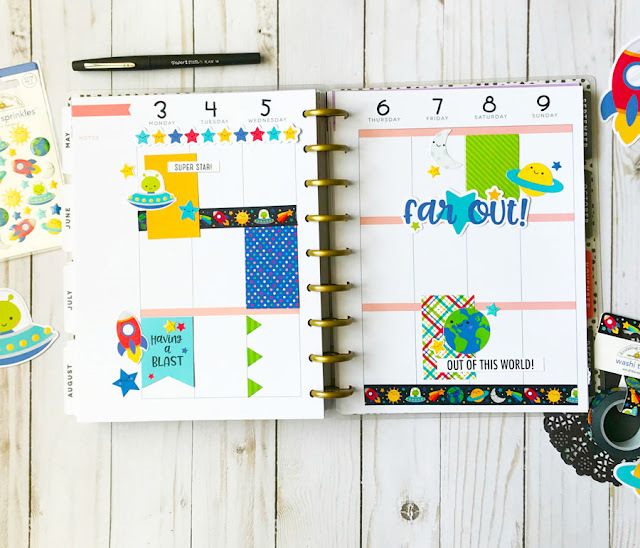 This would be perfect when I finally get my hands on the new Doodlebug Daily Doodles Travel Planners. To make this cover, I cut the "pills" 12x12 paper into the size of my insert. 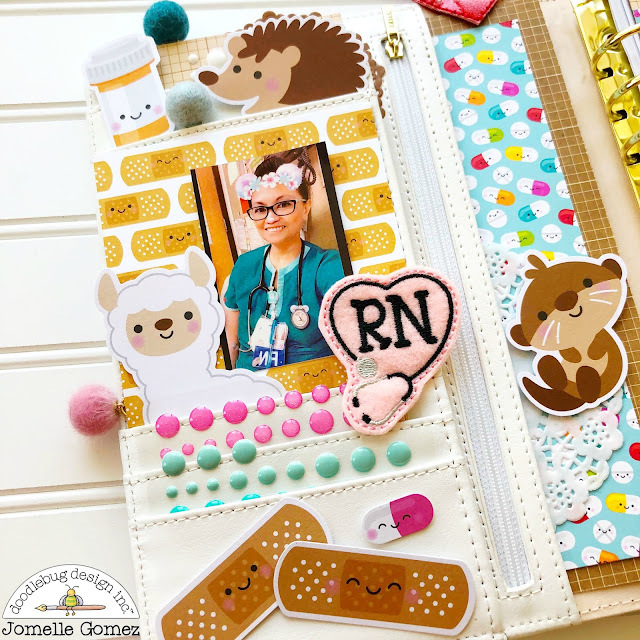 I then added a vellum to create a pocket and I finished it by decorating using the band aid washi tape, scallop border sticker, brown doily and the "pill better soon"element. 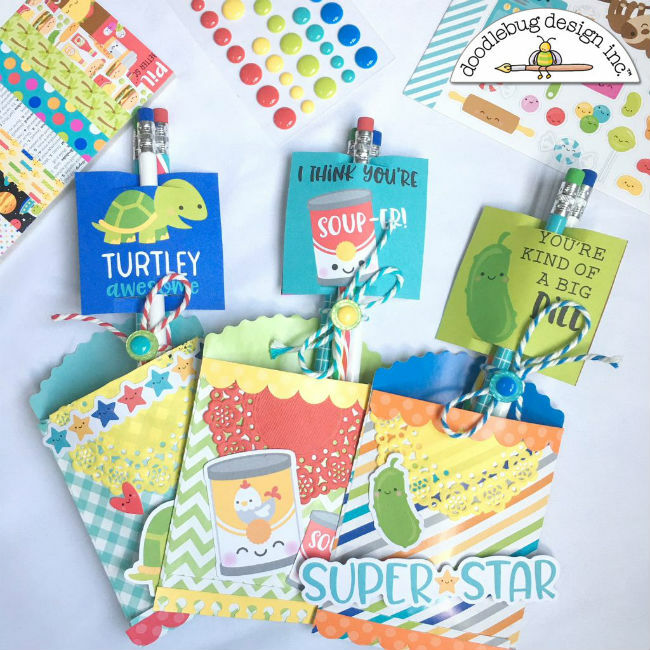 I hope you "hang around" for more inspirations using the So much Pun collection. So stay tuned. Were you excited as much as I was with this collection? Which theme is your favorite? Were you also looking forward to working with some elements that relates to the medical field? I am hoping that Doodlebug will release more elements including stethoscope, syringe with a needle, crutches and definitely a kawaii nurse. 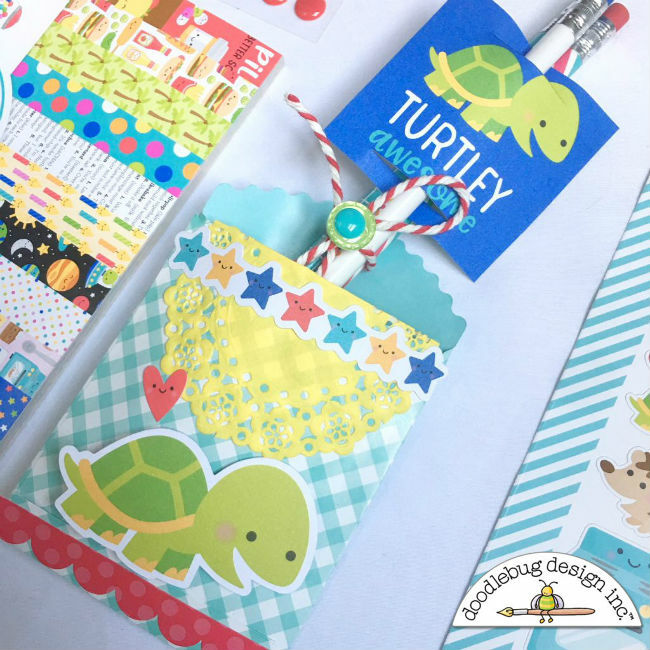 It’s always fun receiving a new collection of craft product and getting excited looking at all the fun and beautiful designs. There are so many wonderful themes within the So Punny Collection that it was hard to choose where to start. 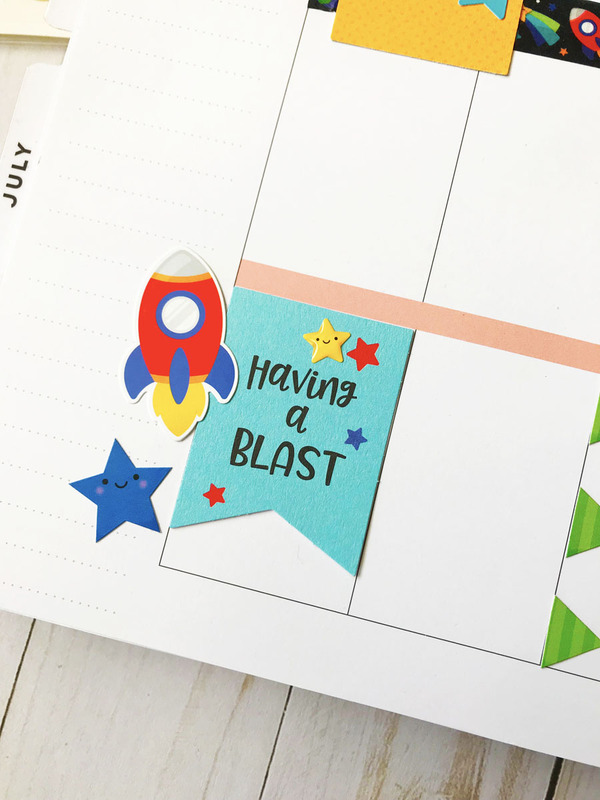 However, I was so taken with the cute little rocket ship that I had to make a cut file. 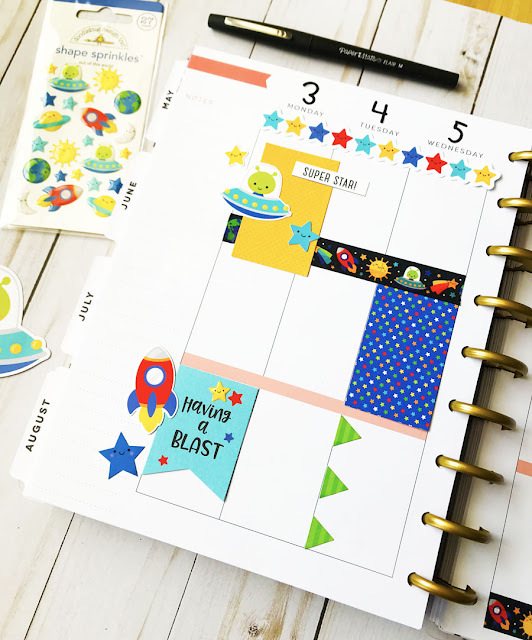 So, my idea behind this layout was simply a space theme, I wanted the background to have lots of stars and the rocket ship and title to be the main focus of the layout. I’ve created a process video for you to see how it all came together. I also added a little window where I placed the little sticker with some sequins. I cut the star background cutfile using white cardstock and backed it with yellow cardstock to add lots of little stars to the layout. I also added that cute alien to the corner of my photo. 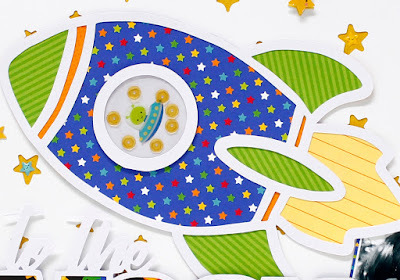 I also added the cute little shape sprinkles stars inside some of the cutout stars. I hope you have enjoyed my inspiration? I am loving the new So Much Pun collection because you can have so much fun with it, no pun intended! 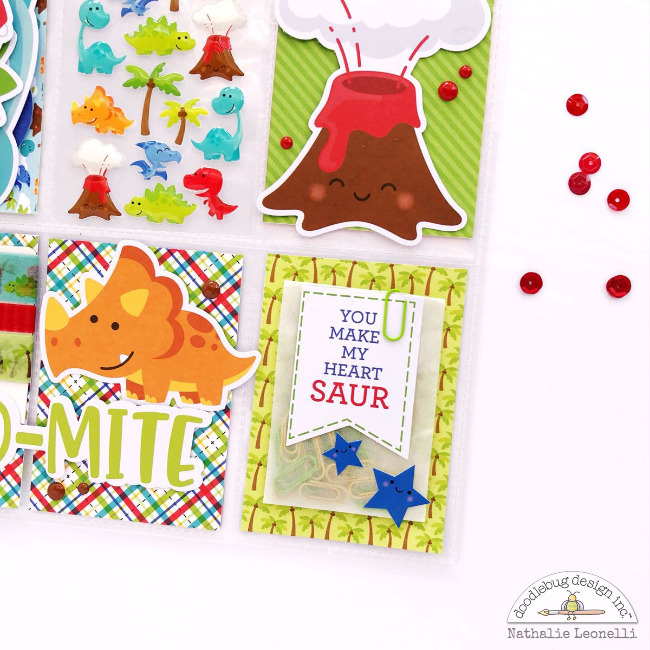 I know I did while creating this Dino-Mite pocket letter! 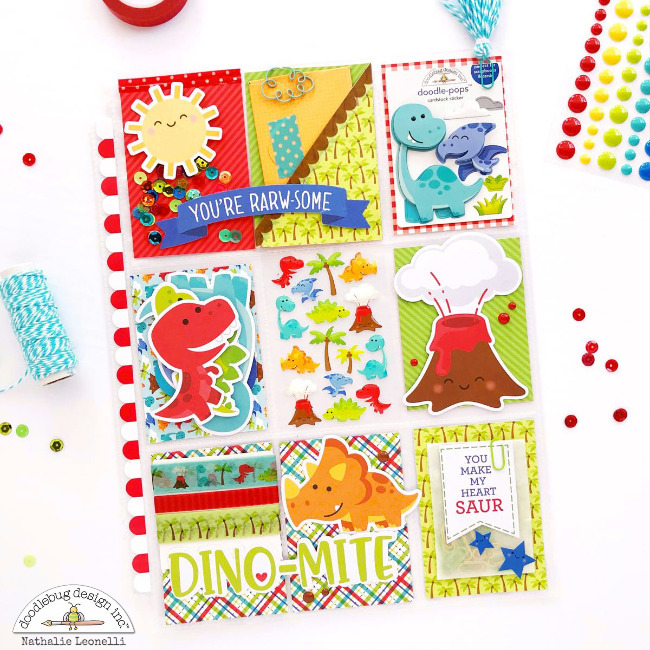 As with many of my projects, it started with the Odds & Ends pack from which I selected all the dinosaur related diecuts, and a few more. I also included a Doodle Pop because it fits perfectly into the pocket of this trading card page protector. 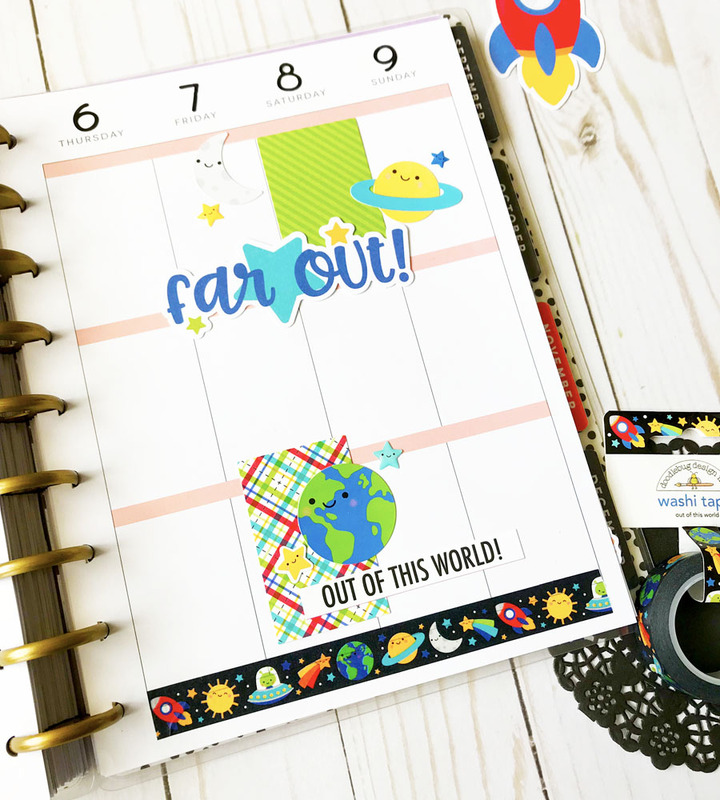 Using some Doodlebug twine and a mini paperclip, I created a fun mini tassel clip that can be used in a planner. Also, I like to have a see-thru element in my pocket letters so, right in the middle, I inserted a pack of Dino-mite Sprinkles out of its packaging. Again, they fit perfectly! 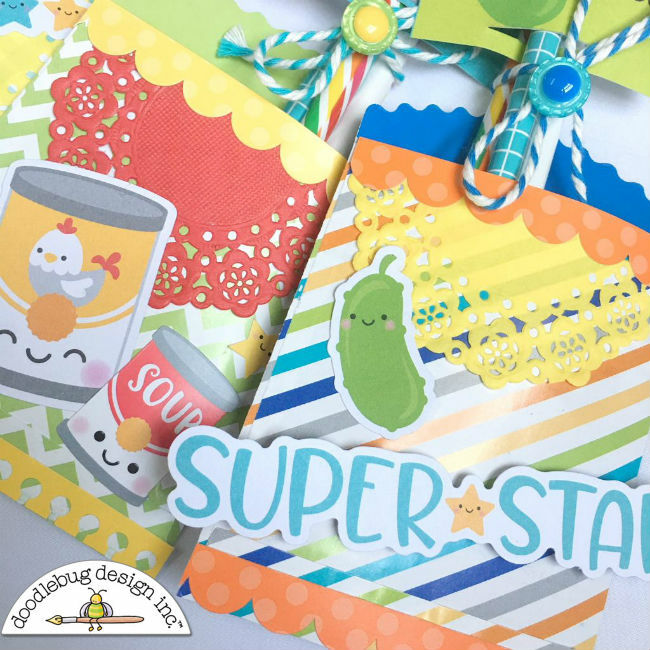 In the bottom pockets, I have included samples of matching washi tapes (above) and a small bag of paperclips which I decorated with star stickers from the This & That sticker sheet and a banner from the Chit Chat pack (below). 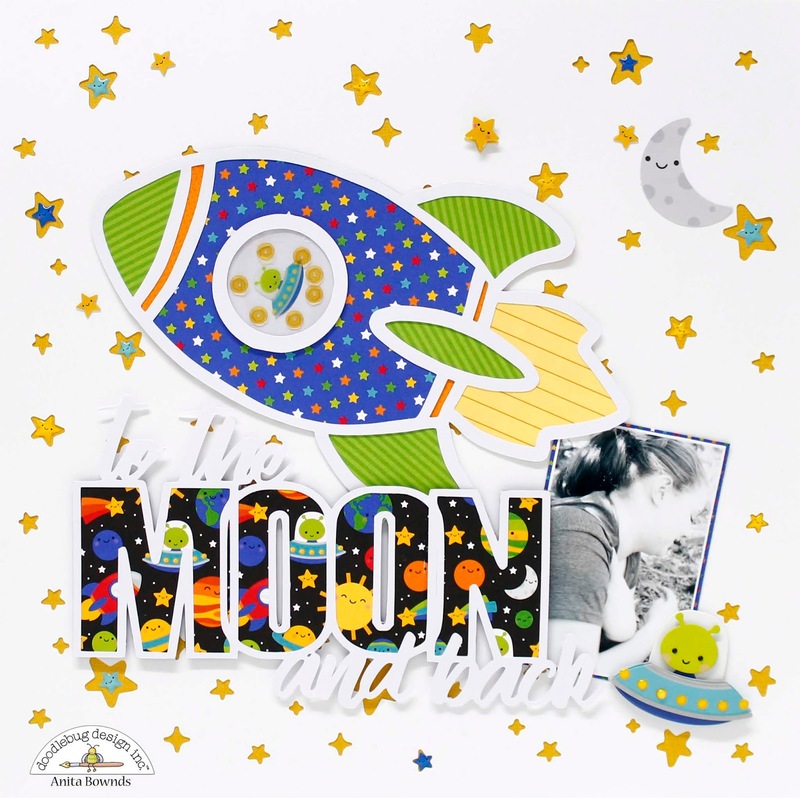 Finally, I created a sequin pocket with a mix of colors matching the rest of the project and added a few diecuts from the Chit Chat pack right on top of the page protectors. 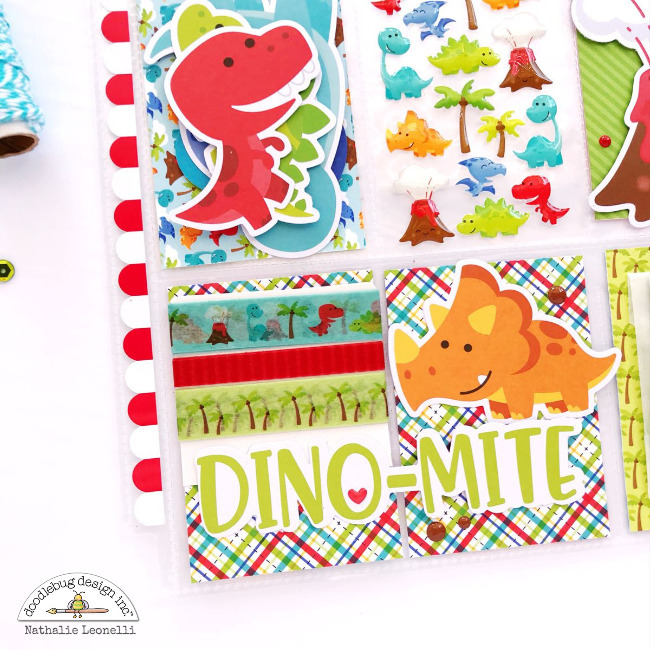 I am willing to bet that you had never seen a dinosaur themed pocket letter before! But you have to admit that is one super cute piece of happy mail and I can't wait to send to its intended recipient!